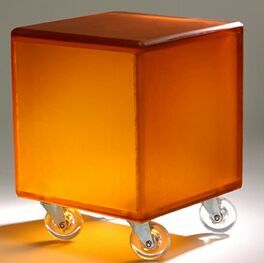 This shining little thing is a multipurpose object with rollers, christened as Cube. You can sit on it incase you run short of space, you can use it as a moving coffee table or for that matter even as a rolling ottoman. Something as handy as this becomes extremely important at times, add to it the wheels and it becomes a must-have due to the convenience factor added. The Cube is available in six electrifying colors in three sizes. Namely medium large and X-large, priced at $899.00, $1650.00 and $3900.00 respectively…phew! Now that is what I call pricey folks!